EZ Rider may be the one in need of rescue once he reviews another Takara Tomy series and the spiritual sequel to Ryukendo. Toku Time: Tomica Hero Rescue Force Review (Part 1) from EZ Rider on Vimeo. Toku Time: Tomica Hero Rescue Force Review (Part 2) from EZ Rider on Vimeo. Looking forward to that OOO review. I’ll have to finish the series. Please review Kamen Rider W .
Funny thing watching this review after KR Drive, when AI Daaen appeared, all I could think was that Banno got his own Tridoron. “Blippen” huh? Also, the voice of the Rescue Force Equipment and Computers is the same as Batsu. I was thinking it seemed like Rescue Force were supported by Z-ONE. That’s the “FINAL RESCUE” for you, EZ boy! GET TO VORK! 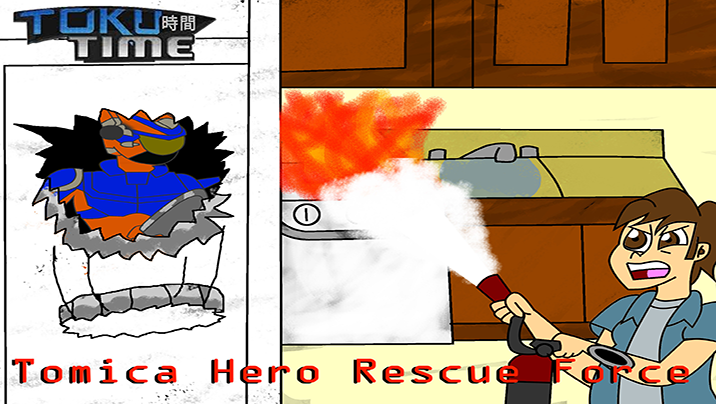 Tiny request… DO RESCUE FIRE! X90000!